"Striking Summer Workshop #2 " This fun flower arranging workshop enables you to create both a Contemporary table design plus an eye catching free standing arrangement with a feel of Summer and each incorporates the use of leaf manipulation to enhance their visual impact. 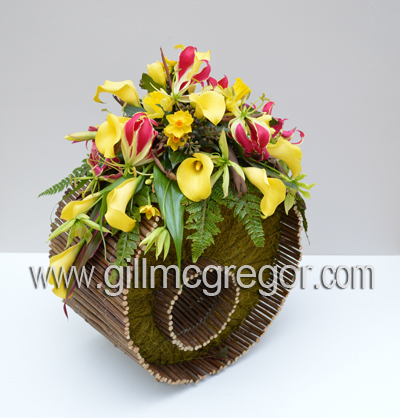 Course description: Flower Arranging Courses - One day Contemporary course - making a sisal / willow container. I have had many people asking how to make this container and so by popular demand this class will teach you in stages how to make this reusable container and complete the course by arranging a design for you to take home. The class size is limited to facilitate the professional teaching necessary for this Contemporary class. Each element of the design will be individually taught to ensure each student constructs each commodity correctly before being taught how to arrange the final design for you to take home. You need to bring your scissors, wire cutters, notebook, camera and a packed lunch - drinks will be provided. Refreshing changes to the way you can learn. A typical week for Gill includes floral art demonstrations (often booked 2 to 3 years in advance) and flower arranging workshops around the country. Gill also provides existing students with 'One-to-One' lessons where they study either flower arranging or floristry. For new students and workshops Gill maintains a flexibility in her busy schedule so that she can take on new teaching and demonstrating commitments. As a new student all you have to do is contact Gill to discuss what you wish to learn and with some dates that are suitable to you and in discussion arrive mutually agreeable dates. Gill can also walk you through the option on cost of tuition and materials that would be required. Gill offers the flexibility of 'One-to-One' lessons so that students can learn what they need to learn to achieve their individual goals without making the time commitment expected of them if they were otherwise to attend traditional college courses. Gill lessons are all about concentrated practical learning Student goals can, for example, be to achieve a higher practical grade in their floristry exams or to improve their creative skills when they design their next floral design. Workshops provided by Gill can be held at your local venue or run for your group of friends and often by businesses who wish to help their staff develop new skills; banqueting and hotel staff come to mind. There are just so many people that do not have the time to attend the traditional longer term college courses yet really love making floral designs and want to do something new, refreshingly different and one day workshops are a very good solution. You choose when; from available dates. The college's website depicts many different courses, that have been run previously, as a source of the variety of subjects that you can learn. Armed with an understanding that you can organise your next lesson as either a One-to-One, or as a Workshop, your next best step is to call Gill to discuss what you have done so far, what you would like to do next, where and when it could be taught. Gill in return can clarify any questions that you have, offer available suitable dates and advise the likely cost of materials and cost of tuition. Please contact me via phone or email to discuss your course requirements/costs. Please contact me via phone ( 01707873944 ) or email ( courses@gillmcgregor.com ) to discuss your course requirements/costs.